I have done many, many kinesiology courses and Integrated Healing is by far the best course I have ever done. Since I’ve started to use IH, my practice has become so busy that I am booked months in advance. Many students are looking for advanced workshops to complement their current systems. They want more power, simplicity, maybe something really different, and good manuals. Integrated Healing delivers on all levels. I highly recommend IH to students who are open to new ideas and want to access and clear deep issues for their clients. Fabulous! So simple, so helpful, so effective, so complete. I feel I now have that ‘missing something’ I’ve been searching for. IH is a profound healing system. The simplicity is the gift. The power and the majesty of mastering this simplicity lights the path for the future of healing! Your Integrated Healing system has transformed my clinical work! The IH protocols are the foundation of my clinical work, even though I’ve had many years of training and gathering other tools. Huge CONGRATULATIONS on the great results of your work. Uplifting! Absolutely wonderful! Every kinesiologist has to do this course! Integrated Healing re-ignited my passion for kinesiology. Liberating! Refreshing! Simple, yet so extremely powerful and life changing. Mathilda is such a beautiful and passionate teacher and healer. She glows with integrity and love, as does Integrated Healing. Integrated Healing is phenomenal! I use the IH protocol as a basis for all my healing work. Thank you, Mathilda & Nic for being part of the Universal channel to make this happen. Absolutely amazing course. This has been the most soulful and joyous experience I have had in this lifetime! I come alive when I do this work. Thank you!! The simplicity that accompanied such immense power!! Mathilda is an angel and IH is from God. Learning IH was like meditating and knowing it was part of me. Love the clarity, simplicity and clear cut procedure for working through ‘big’ issues. The multitude of root cause issues that can be addressed is staggering. Great personal shifts in this workshop! Enjoyed the Self-Empowerment! I was really amazed at the amount we covered and integrated. I love the easy fixes the course provides – can facilitating healing be so easy (?). This learning will redirect my life entirely. Thanks for sharing your amazing knowledge and energy. Awesome! Best course I have been privileged to attend! Thank you! I believe IH has the power to change peoples’ lives in profound ways! God has given you a unique gift of healing that is blessing lives. Excellent course, best I have been to!! Powerful and comprehensive. I can now give my clients a much more beneficial balance in a lot less time. WOW! SO ENLIGHTENING! It is wonderful to have such a safe environment in which to learn, and have so much fun at the same time. IH is so gentle, yet so profound! I am truly grateful for the experience and re-assurance that attending this course has given me. The empowering is awesome and created a self-awareness for which I am deeply grateful and truly blessed. I love the simplicity and genuine ethics behind IH. It feels like this is the beginning of a new life for me. IH checks all the boxes of the kind of therapy I have always wanted to provide. I’ve had some balances on the course that are phenomenal and that will change the way I lead my life from now on. Thank you. Also, to know that these techniques focus me entirely on the root cause is an amazing confidence boost. Fantastic course! Very Empowering! I love the way you share so much and give so many of your tools without being ‘precious’ about it. I have been waiting for a long time to incorporate Spirit into kinesiology. Congratulations on an awesome job. AMAZING! It is an honour to be taught by Mathilda!! I feel I have learnt so much and it makes me feel very empowered. IH feels like ‘home’. Shifts happen so quickly and profoundly. One feels so ‘at peace’ after the balances. The course is an enormous wealth of information. I really appreciate how working in the hologram speeds up the balances while catching all that’s appropriate for the client at that time. Thank you so much for getting this out to the world. I feel so overwhelmed with appreciation. IH is just what I was looking for. It is in-line with all my beliefs and theories – I just can’t believe someone walked in and explained everything to me. IH was divinely inspired. The simplicity of the technique was wonderful. It provides the impetus to use it, but the simplicity in no way affects the enormous impact of the balances achieved. My other healing modalities can now be used as a compliment to IH, which will form the basis of my healing treatment. IH will transform my work, as I seem te be getting clients with deep-rooted issues. Mathilda and Nic are, apart of being so capable, two of the most delightful people I have met. IH taught me to listen more carefully, and have more patience and understanding. I just found the whole course fun! And very inspiring. Looking very much forward to the next module. Fantastic, informative, caring and fun course. I use IH now when working. It has filled a void and given me SOOO much more confidence. I am transformed! Loved it! Very informative, structured and well planned. I will now be able to really do a well ‘educated’ healing/balancing session with confidence. IH transforms everything. It will continue to transform my life and my work. As a homeopath I know there are things which cannot be fixed/helped by homeopathy and I believe IH covers that part. Supreme! Way beyond what I expected. Simple but powerful. IH will change me, my therapy and my clients for the good forever. One of the best courses I’ve been on – at all levels. Having a clear, concise manual with a step by step protocol gives confidence. Most valuable, especially phobias and working Holographically. Most beneficial – “especially learning to trust”. The most fascinating course I have ever attended. IH will totally change the way I have been working so far. An essential course for any hands-on-healing modality. This is the best course ever. The course was amazing and the balances quite miraculous! Well done, you are such a blessing to all kinesiologists and healers! I loved the course and both of you will always have a special place in my heart. Thank you for my heart path! Best course I’ve been to. Excellent course content – Sacred information! Wonderful! Excellent Course – Simple and complete protocols that cover everything. Unbelievable. Every day was an enlightenment. I now have an elegant and exceptional tool. The hologram environment is a huge improvement. I loved the simplicity of the structural corrections. Love the simplicity of the balances and the combination of NLP and spirituality. Life changing. Reconnected with faith. Thank you. Superb course. Loved your whole attitude to healing. I realised how ‘sacred’ this work is. It brought a totally new dimension to my work, working at such deep levels. IH will be a major part of my naturopathic work. Fantastic. Thank you. Soul searching, inspirational. IH has taken me way beyond my beliefs and to a level I didn’t know I could reach so soon. Thank you! IH is amazing – I just wish more people could learn about it more quickly. Deep gratitude for this course. Phenomenal! – Highly recommend! Amazing that we can retain the amount of info. Thank you for making it possible. IH put me on the path I need to be on. Blown away! Great balance of information stories and humour. It has given me the avenue to use kinesiology that has been missing for me. So easy but so deep. IH covers all components of the being and related to the being. I am so grateful for being given this opportunity. IH has enabled me to unlock abilities I didn’t know I could use so easily. You have given me direction to my life path! Saying thank you seems like it is not enough. When I came to this course, I didn’t have a clue what it was going to involve, but I was pleasantly surprised. I thought it was amazing what huge changes you can make to someone’s posture, pain, etc with so little effort. I will be able to use IH straight away, without having to re-write loads of it, which I have done on EVERY other course I’ve been to up to now! This is a fantastic modality and will be the main focus of my work. This course is waht I’ve been waiting for. I’ve been looking for something to get to the root of clients’ issues and clear then. Now, thanks to this wonderful course, I can do that – and more – with confidence. Thank you! Thank you! A truly informative and ‘true’ course presented with absolute ‘pure intent’. Thank you from the bottom of my heart. I find it amazing that I can remember most of the huge amount of info – wonderful! From now on my balances will be shorter and easier. It will also cover a much broader range than before. So much valuable new information! Great system. Easy to follow. Practitioner stress is reduces so much! Definitely will incorporate IH in my work. Working holographically will form the basis of all my balances. Every part of this course was FASCINATING! I feel privileged to have attended this course. It had life changing and enhancing effects! IH will bring my work to a totally new level – it’s the missing link I’ve been searching for. Theory valuable. Practical most enjoyable and a WOW. I was captured the whole day. This course has given me the confidence to start my own business. Thank you. The structured protocols and the practical applications are most valuable. Loved the colour coding and the practical examples. IH is much easier to use. I love it! This course was just what I needed. Jam packed with great balances. I now can integrate all my learning/therapies into one protocol. Excellent. Loved every protocol and the NLP techniques. This course has expanded my kinesiology world. Amazing course content, and wonderful, lively presentation. I’ve got my life back. I will probably only use Integrated Healing in my clinic, it is so profound. Wonderful insights! Immense amount of info. Easy to follow presentation and manuals. All the practical work was absolutely amazing. I feel privileged to have learned IH from you. A big thank you from the clients this will heal. Fantastic workshop! Huge expansion on my tool chest. Love the ease and depth of corrections. So special. An amazing gift for healing in a totally holistic way. It is beyond words how good IH is. This course is extremely comprehensive – topics not dealt with in other courses. I feel much enabled to live/work effectively. Thank you. This is an awesome course. Thank you for your gentle, loving approach. Excellent knowledge and great presentation skills. Manuals very user friendly and the layout is great. My healing will now be focussed on this process with all the other courses as part of my healing correction tools. Excellent. Huge topics made easy. It was enlightening. I will definitely use Integrated Healing as the framework for all consultations. FAB! One of the best courses I have ever attended, a very, very enjoyable experience. A very spiritual two days. Feeling empowered – not shying away from people with difficult or complex problems. IH gave me the ability to incorporate spirituality into my work. Simple is profound! A breath of fresh air, Brilliant! Excellent course. Comprehensive, well planned, honest and sensitively delivered. IH has opened my mind and possibilities/ opportunities in healing. IH is excellent. I love it! I know my balances will hold longer and work on an even deeper level. This course is so amazing, I know I do not want to do any other therapies. The quality of my work will be much better because of this course. Very special atmosphere. Very allowing space. Information went straight in – NO STRESS!! The nicest course I have ever been on. I use these protocols in every balance I do, as I feel they are more complete and comprehensive and easy to understand. We’ve covered all the things I felt before were missing – very profound and inspiring. Thank you both. Awesome experience! 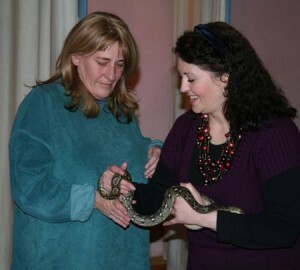 Especially the demo balance where a student lost her phobia of snakes! A great course presented in a very positive way. Excellent. My intuition has heightened. This course has been the most amazing gift for me and those I will now be able to assist in their healing. Amazing Course. Light and bubbly presentation with good revision. Excellent manuals, clear and foolproof, the colour coding is fantastic! Balances will be much quicker and more effective. The integration of all the work I have done before and this course has enhanced my knowledge, creativity, and style of work/healing. I will incorporate IH in my work on a daily basis. As a newly graduated kinesiologist IH puts a ‘not scared to use it’ approach on the treatment. You covered all levels and dimensions of the being. I walk away from this course satisfied that I can make a difference, and that is the most special gift. This feels like home. IH is fantastic and is where I am happy to be. Thank you so much. IH gives me trust when I am on the table, peace when the balance is finished. This will be the way I work. This course offers a new paradigm of thinking/working from. I love the energy of IH and how gentle and caring the balances are. It will be the new approach that I use! Big Statement! UNBELIEVABLE! Every part of the course was brilliant and fascinating. Self empowering! PROFOUND! I love the way you have designed the protocols to give such powerful access to the holographic construct. Already major improvements in my life and work. Thank you both so much! IH will most definitely enhance my ability to understand and facilitate the healing process of my clients. Outstanding course!! Mind-blowing. This course far exceeded all my expectations. Great, amazing, exciting, new, beautiful!! Love the simplicity. Well presented, great energy and humour. Thank you for sharing your knowledge guys. I love the gentleness of the approach and the genuineness of Nic and Mathilda. Excellent manuals, really easy to follow, love the colour coding. FANTASTIC COURSE!!! Loved it! Enjoyed the simplicity of the protocols. The layout has given me a lot of confidence in kinesiology and practicing it. It will enable me to get into realms that I haven’t been into before – I can think of many clients who really need the work in this manual. Thank you, thank you, thank you! I will start using it on my clients immediately. IH is soooo exciting, it’s fun and it’s incredibly easy. Simplification in every area. Brilliant! I love it!!! Top quality course. It has moved me to another level, given me confidence personally and work wise. I’m so grateful for your love and support. I love IH. Thank you both for passing on this gift. This is healing with ease and grace. Love the simplicity and gentleness of this work. It will change the way I work completely as I will now use IH as my format and starting point. Absolutely loved this course. Just what I was looking for. Please come back soon. This course was the missing link of what I needed in my life. Amazing! A fantastic course.! Very informative but simple. A lot of important work was done on myself – I feel great! Amazing! Fab! IH will allow me to help people in ways I didn’t know possible. IH is all so personal and huge and valuable. I love IH and it IS my work. I cannot explain the wonderment and joy of this course. AWESOME! Excellent course. These protocols are gifts. Great course. Inspired confidence and I know I can cover much more territory on any client in a more efficient manner. WOW! All the clearing I have done on myself have made me feel so much lighter. I am excited about the confidence I have gained. Life changing. Inspired. Empowerment in listening to the Creator. Great to be confident that no person I work with will have a healing crises. Every part of the course overwhelmed me – amazing. Please continue to bless the planet and its beings with IH. I was blown away from day one on the treatments, presentation, visuals, stories. Everything was outstanding, fun, interesting thorough. I feel so blessed to have been on this course. Well researched and inspiring. Thank you for all your work and research and the lovely joyful and natural way you present it. Since using the Healing Pathways protocol my balances have become more profound. Brilliant course, easy to follow, fantastic presentation, clean concise manuals! Love IH. All the protocols are really easy to follow. LOVED Inner Child balance. IH will add so much simplicity. Your natural teaching style and natural ability to reach out and support students on the course has re-affirmed the way I would like to teach. I found you both open and giving, whilst maintaining your inner strength. Fantastic, inspiring approach.